Worms kinda lost it’s way big time. Some games welcomed the switch into 3D, making them feel fresher, fuller and on the whole a lot more enchanting. Worms was not one of those games. Last year, Team 17 decided to bring the series back to it’s routes. DS and PSP iterations of the game reminded us why the game was so crudely popular on the PC way back in the mid/late 90s. A combination of beautifully characteristic sprites filled with personality poured depth into the game. This coupled with the deepest of understated ironies created a title with not only laugh out loud humour, but also honest and straightforward fun. Worms is a game with simple and inviting gameplay and, while sceptics of Worms: Open Warfare 2 would be quite correct in saying they’ve seen it all before – they’d also have to be very straight faced to say they didn’t enjoy the game at all. 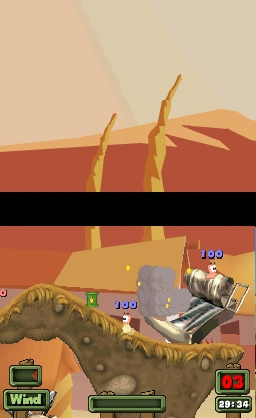 For those of you that may have never actually played Worms (where were you in the 90’s?) though, maybe a small explanation of the game will be required to aid your understanding. Basically, Worms are worms. Pink in colour and bumpy in texture, while they may look like your run of the mill garden worm (albeit in exaggerated cartoon form), these little fellows do not act in the same way as average worms. Placed on various different (bizarre) battlefields these worms must wield Uzis, Bazookas, and well, exploding sheep in order to defeat the enemy. Fun eh? As with all Worms games, on booting up the DS you are treated to a nice 3D movie intro and then you are thrown straight into a tutorial giving you a helping hand with the movement of your worm and also the use of different types of weapons and items. To be fair the tutorial isn’t exactly newbie-friendly when it comes to explaining the concept of the game to you. But, it’s excellent for teaching the essential controls within a short space of time. Prior to the tutorial, one of the first things you will be able to do is to create your own Worms team. This is an excellent idea as they are fully customisable. Not only will you be able to name each worm but you will also be able to select their skin colour, language, grave types and edit your teams flag/avatar (like in Mario Kart: DS). It’s probably worth mentioning here that you can also build your own level: another lovely addition. 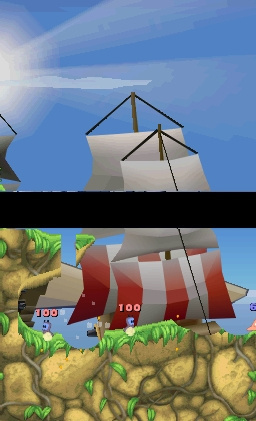 The DS’s two screens are used together so that the very top of the screen shows the top half of the map and the bottom screen the bottom half of the map. Given that the DS screen is only so wide things do get a little claustrophobic at times but it’s nothing too major that distracts the player away from the fun of the game. It’s just a minor niggle. Multiplayer has always been a key element to the Worms games and it’s obvious that this iteration of Worms has really pushed all the multiplayer options of the DS. Players can play via Download Play off one cart and stage battles with random teams or alternatively, custom teams can be played against if everyone has their own Worm’s cartridge. The stand-out mode here though is the Wi-Fi option. With experimentation I discovered the online play to be flawless. (Although there are some expert Worm’s players out there, so beware!). There is much fun to be had within the online branch of things. With constantly updating and changing leaderboards and the option to play against either friends or total strangers one could lose an afternoon or so indulging in the joys of wireless online Worms. They should issue some kind of warning with the game: it’s so addictive! For those that are simply interested in playing alone there are quick matches which throw you straight into a match; a campaign with a loose storyline; and a puzzle mode which sets you certain objectives and a time limit. All of these create a deep and thoroughly playable experience that will keep you occupied for a long time. Throw in some unlockable content and you pretty much have the perfect package. It’s hard to pick flaws with Worms: Open Warfare 2, it really is. People that aren’t fans of turn-based games will find this war far too slow paced and uninteresting. But. for anyone who ever enjoyed Worms back in the late 90’s, or anyone who likes good games, this is a breath of fresh air. It still feels fresh to me. Apparently it was a totally different team to the one that developed Open Warfare. The thing with the game is - it's impossible to pick any faults with it. It's just good. And that's why it got a 9. Good review. After the travesty that was the first Worms OW game on the DS I was all set to give this the wide berth. However my friend picked it up and we had some single cart battles, needless to say it is a huge improvement and I am going to be picking this up soon. 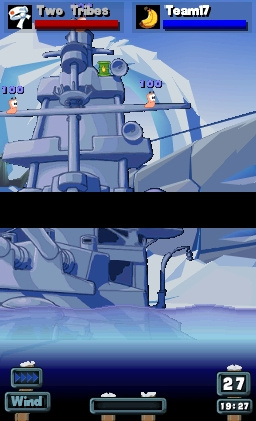 There's something timeless about 2D worms. With a few players it really is a great game. Nice. 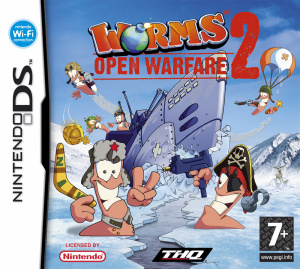 Here's hoping for a decent 2D Wii Worms title. Looks good. One question although. How did you play against people on Wi-Fi if the game isn't released yet? I understand that there could be a bunch of reviewers/testers, but it was made to sound like there are a lot of people actually online so that you could just play. Another classic game that suits the DS console. Definitely one of my favorite DS games. It's just a great portable version of the Worms I know and love. Being able to still play it in hotseat multiplay by passing around the system is also nice.